In my "Small Town Shopping" post last week, I showed you a few of the treasures I found while browsing the thrift stores in the small town of Dunnville, Ontario. I have just a few more goodies to share. My husband and I went shopping without the kids, much to my daughter's dismay. I promised I would bring her something back. 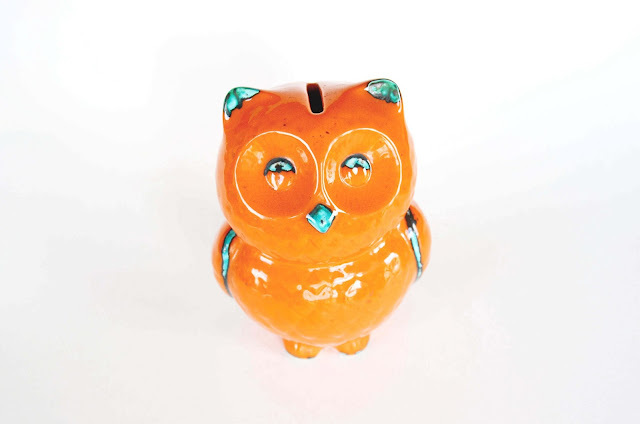 I found this cute owl piggy bank, above, at the Salvation Army shop. When I brought it home, she said, "Is that all?" Well, I like it anyway. I also came home with this pretty floral bowl, which simply says "Germany" on the bottom. I got this glass lidded dish for $1. The sticker says "Paşabahçe Turkey." I also did a bit of thrifting at my mom's house. 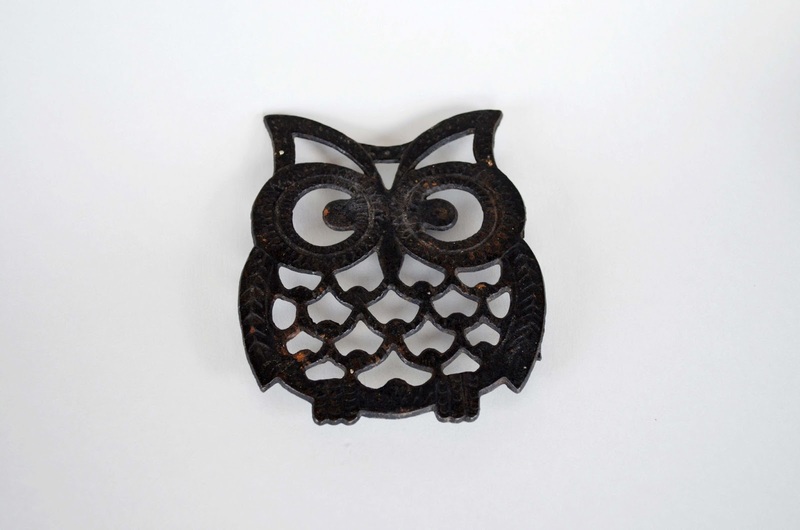 She finally gave me the owl trivet I have been admiring for years. Inspired by my friend Jill, I got my very first piece of Pyrex. I really don't know much about Pyrex, but I bet Jill could tell me more about this piece. The Salvation Army had an amazing book sale. I need another book like a hole in the head, so I didn't look too closely. 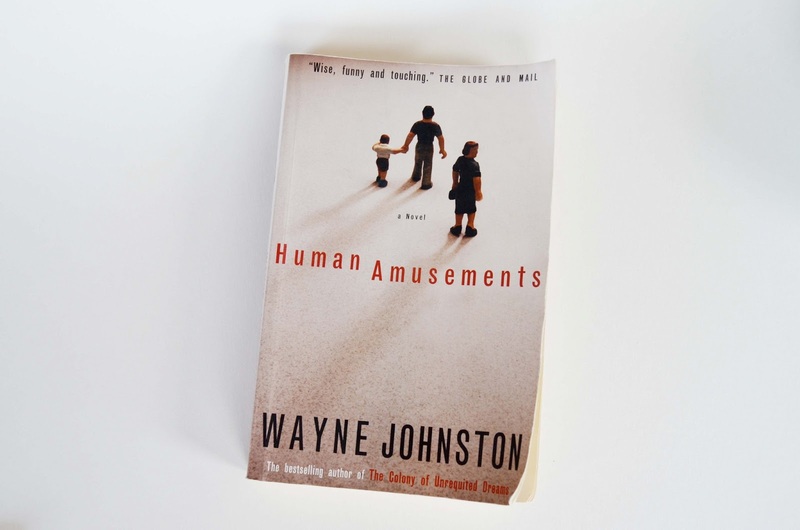 But I couldn't resist picking up "Human Amusements" by Wayne Johnston for 10 cents. I really enjoyed reading his "The Colony of Unrequited Dreams." I'm hoping this one is just as good. Published in 1994, "Human Amusements" is Johnston's fourth novel and the only one set outside of Newfoundland. It is a send-up of television's early days. It is the late 1950s and in lower middle-class Toronto, Audrey Prendergast, whose love for her family blinds her to all else, sees the new medium of television as the only means of climbing the social ladder. And climb it the Prendergasts begin to do when Audrey launches a children's show called Rumpus Room, starring herself as Miss Mary and her young son Henry as Bee Good/Bee Bad. The program becomes an overnight sensation, and the Prendergasts' world begins to change, much to the chagrin of Audrey's husband, Peter, family comedian and would-be novelist. Determined to keep his family anchored in reality, Peter refuses to have anything to do with Rumpus Room and throws all his energy into writing his novel and doing an almost non-stop and hilarious commentary on modern culture. I also bought this book about elephants for 5 cents, because I want to do a study on elephants with the kids. Have you found any treasures recently? Wonderful stuff! Nice Pyrex find...I believe that's the Butterprint pattern. I have a small bowl in that design and it's one of my faves. 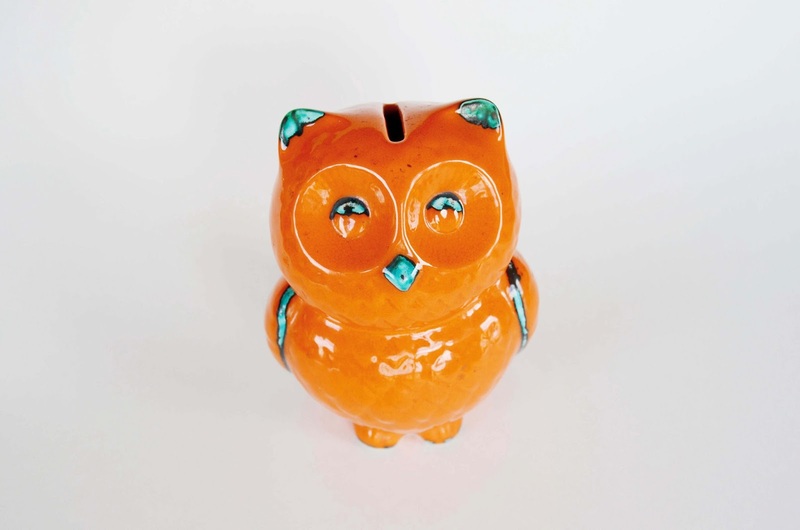 Love the owl bank, too! Thanks Heather. I don't often see Pyrex pieces. Maybe people buy them all up? Nice finds. 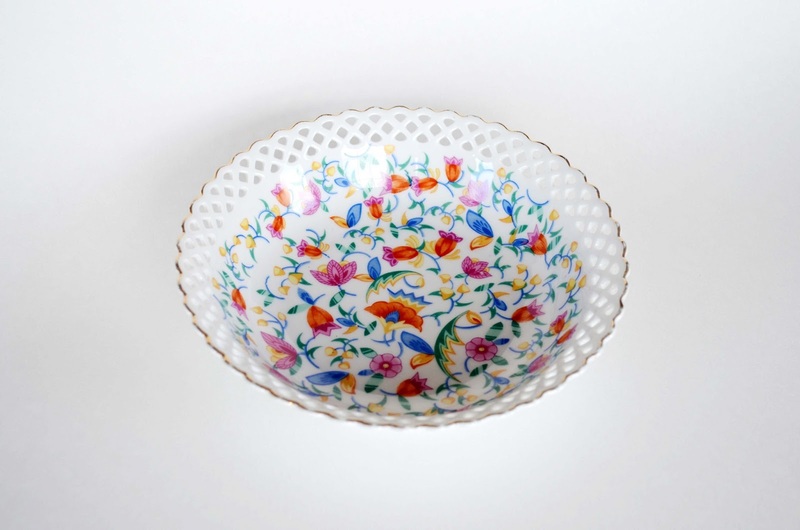 I love the pretty dish, the cutaway detail is so fine. I can see why you like it. I just have to worry about storage. I could see me starting another new collection!! 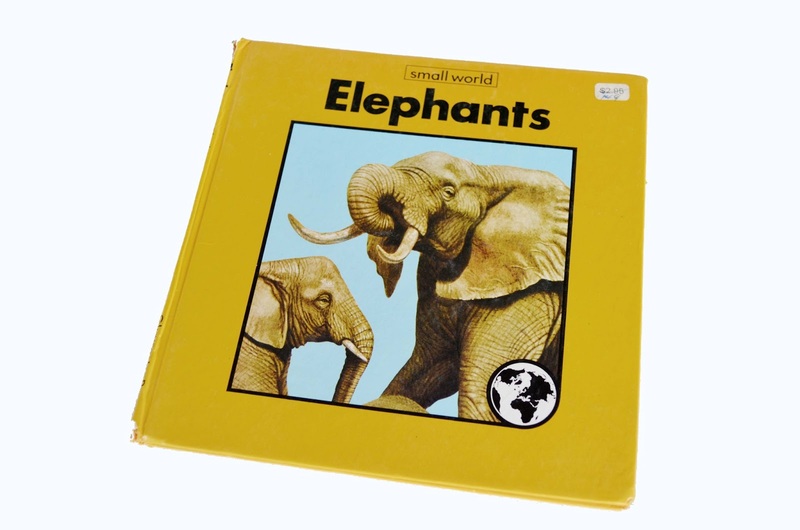 I think I need to find a book on elephants! My 2 year old has starting telling me that there are elephants in with the cows as we drive past all the dairy farms around here. It's pretty cute and will let this carry one for a little while longer. Your first piece of Pyrex??? Yes, it is Butterprint, it's a very popular pattern!! Good find! Looks like it's part of the bake serve and store set! They're a great size of leftovers. Love the owls, have you seen the reusable owl bag at HomeSense? It's sweet! Yes, my first piece! It's one thing my mom doesn't seem to have. And I don't see it around much. Thanks for the info. Is it supposed to have a lid? I haven't seen the bag. I will have to check it out! 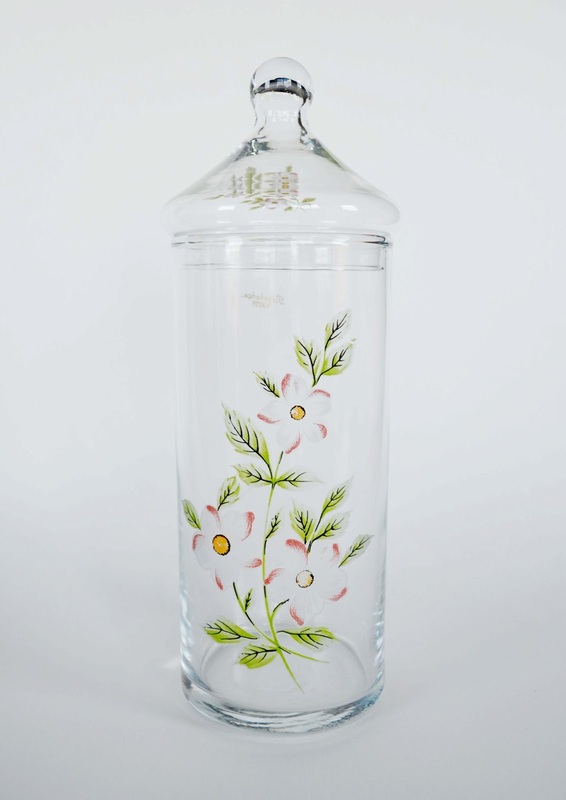 Great Pyrex piece! It's been so elusive to me & I've been collecting (in Ontario!) for 2ish years. I had to pay $8 in an antique market in Michigan for it, but found another one in a market here in Ontario. Wasn't gonna pass up a second one! I like the owl, too. If it was my niece, I would have said, "I could have gotten you some used undies, too, but I decided to pass." or something. Okay, so it is rare in Ontario. Because I don't see it much either. I wasn't sure. I think I paid $2 for this one. Got lucky I guess. The colour IS pretty isn't it? I love that pyrex color! don't have any in the color so I am jealous--all good finds, kids can be quite cruel beasts can't they? I LOVE THAT OWL BANK!!!! Awesome finds! I picked up a few pieces of pyrex oh lets see, ten years ago now? They were dirt cheap at the time lol. Now-a-days its hard to find anything pyrexy at a reasonable price, so well done my dear!! Never HAD PYREX???? Oh man. Now you're hooked! I also love that Turkish jar. So pretty! That owl bank is so cute. I love the big eyes staring up at you. Great finds! Nice finds. I especially like the owl bank and the owl trivet. So nice you get to make a stop at 'Vintage Shop de la Maman'! I collect Pyrex too and when we had our kitchen renovated a couple of years ago, I arranged to have a big cupboard just for it. We use it every day for all kinds of things so it's very handy, but it's also so darn pretty to look at. I did hear a crash in the kitchen the other day and went in to find that we had lost one of the dishes and it's matching lid. Phooey. I pretended like it was ok, but um, was a bit upset! Such treasures can be found in those off the beaten path stores!! Love that you snagged a book for 5 cents! Thanks for visiting. I enjoy reading about your travels! Your first piece of Pyrex? Oh no....it's all downhill from there! Butterprint is the perfect way to start your collection. It's one of my favorite patterns. You found some pretty awesome treasures! 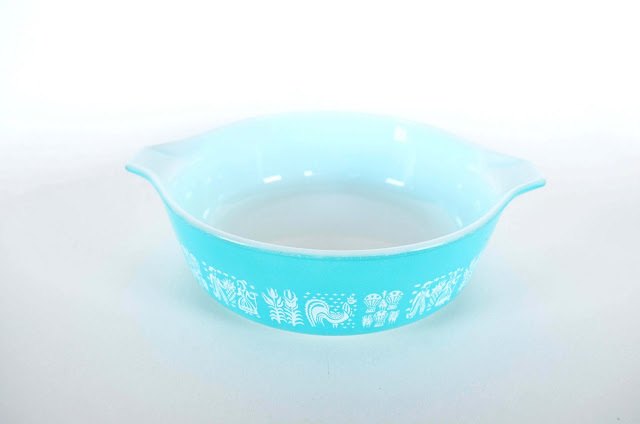 I love Pyrex and I know Jill from blogging...such a pretty piece of Butterprint you found! Be careful, it's addictive. The owl bank and trivet are also pretty cool. I find that if I admire something long enough my Mom will give it to me! I'm that way with my girls also. Diann and I thank you for linking up with TTF this week! I SOOOOOOO love the little owl! You have some really great finds!!!! Thanks for sharing...hugs! I bought my first Pyrex piece a couple years ago, mainly to see why everyone was so interested in them. It was a red mixing bowl, I love the size and it works for so many things. I'm hoping to find more mixing bowls for a reasonable price, no luck so far. I got a couple fridgies and a casserole dish from my grandmother when we cleaned out her apartment. I don't use those, so I'm not very attached to them. The casserole dish is a beautiful turquoise color though, I'm hoping to get something else in that color.